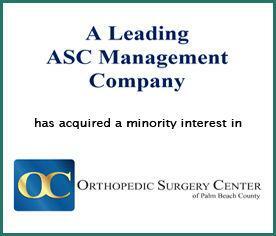 Orthopedic Surgery Center of Palm Beach County, Inc.
A leading ASC management company has acquired a minority interest in Orthopedic Surgery Center of Palm Beach County, Inc. (“OSCPBC”). OSCPBC is the ambulatory surgery center for Orthopedic Center of Palm Beach County, a provider of state-of-the-art, comprehensive musculoskeletal care including the spine, shoulder, elbow, wrist, hand, hip, knee, foot, and ankle to patients of all ages throughout South Florida. OSCPBC’s distinguished team of Board Certified/Board Eligible physicians and surgeons are each fellowship-trained in their particular specialties, and together provide the highest quality treatments, surgeries, and care. Provident Healthcare Partners (“Provident”) served as exclusive financial advisor to OSCPBC. The terms of the transaction were not disclosed. “As one of the newest and most state-of-the-art surgery centers in Palm Beach County, the physicians at OSCPBC will look to leverage their new partnership to continue providing the highest level of care for the foreseeable future,” commented Robert Aprill, Analyst at Provident. “Provident was an exceptional asset in finding the right strategic partner to help us continue our vision. Their knowledge and expertise were invaluable in helping us navigate the process and ultimately find the best partner. I would recommend them without reservation,” stated John Hornberger, Chief Executive Officer of OSCPBC. OSCPBC, which was founded in 2016, is a comprehensive, 9,000 sq. feet state-of-the-art surgery center with three large C-class operating rooms, 12 recovery room bays, and concierge services, along with a private and convenient patient pick up location. The surgery center’s 15 physicians are skillfully trained in orthopedic surgery, pediatric orthopedic surgery, and hand and microvascular surgery. For more information, visit http://www.oscpbc.com/.